There is no better place to be than the farm for tracking the changing of the seasons. It seems that, in the blink of an eye, tender zucchini and sweet cantaloupe are replaced by potatoes and dark green kale, and we enjoy our first glimpse of winter squash being harvested and stowed away for the fall and early winter. 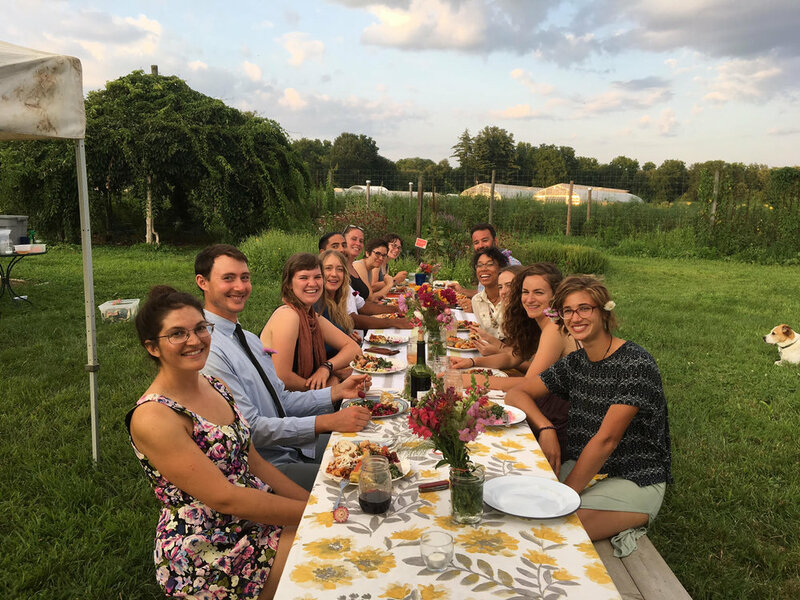 Since farm labor is entirely impacted by the seasons, we also have been saying goodbye to amazing PFP farm interns, as well as a special longer-term crew member who is moving on to other exciting projects. Crops are generally in very good condition after abundant summer rainfall: blueberries and green beans offered particularly large and tasty harvests this summer. Fall brassica crops (broccoli, kale, cabbages, radishes, rutabaga) are looking splendid following the surprisingly cool nights we’ve enjoyed throughout the summer. As always, however, there are winners and there are losers. Cherry tomatoes and peppers growing in the field this summer have not experienced the ideal amount of hot and dry weather that allows them to stay healthy and produce excellent fruit. If you notice haggard-looking cherry tomato plants in the pick-your-own section, know that cool and wet weather has precipitated the spread of fungal diseases. Peppers have been hit hard this season, first by hail when they were very young, and then by multiple heavy rains, all of which has made them more susceptible to bacterial diseases. While we are still able to harvest peppers, fruit ripened rather late this season, and we do not expect the plants to last long into September (despite this, of course, the crew continues to smile brightly while happily harvesting what they can!). We are sad to say goodbye to cherished summer interns, Fiona and Liz. It has been a joy to train and work with these engaged and energetic humans, and also to learn from them. We also say a temporary good bye to Merle, who fortunately plans on returning next season. We will miss you! German, who is a full-season apprentice this year, has recently begun training in mechanical cultivation, which he will be taking over fully next year. This task, which involves weeding beds with tractor implements, requires much focus and careful coordination, since a slip of the steering wheel can translate to 10 kale or broccoli plants being uprooted in an instant. PFP has four cultivation implements that are used regularly, and they help us accomplish the same goal – a weed-free vegetable/fruit bed – in a variety of ways. Some bury weeds, some uproot them completely, and some cultivate the furrows. After brief training last fall, I managed cultivation this season; I am happy to have the opportunity to transfer that knowledge to another individual learning to farm here at PFP. I hope that I’ve helped to explain why patience is needed this season in the pepper and cherry tomato area. Remember how wonderful many other crops have been, due to the same cool, wet weather! The winter squash, potato, onion, and garlic harvests are now complete, and the farmers are excited to chill out a little more and sweat a little less. We are also excited to begin harvesting fall greens and roots! Parsnips, rutabaga, and celeriac continue to size up, and the first tender arugula and spinach leaves have our mouths watering. Enjoy the bounty! Getting back into the swing of things here as an Education Intern has been completely refreshing. As the new semester begins, I think I speak for all of the interns when I say we’re extremely excited to test brand-new recipes, come up with new lesson plans, and, of course, see the lovely kids again. While it was great to see our families and loved ones back home, it’s invigorating to see our PFP family once again. We have been perusing various seed catalogues, carefully selecting vegetable crops for use in the Discovery Gardens. Fun and whimsical produce is going to come into play; the students love working with all kinds of funky fruits and vegetables. We are setting aside a plot of land for a DIY plant Tie-Dye garden, another for the ever-popular Obstacle Course, and we’re always thinking of ways to further engage the throngs of happy and excited students as they make their way around the farm. As a culinary student at the Culinary Institute of America just down the road, I always feel at home in a kitchen. A lot of recipe-testing has been going on inside the farm kitchen, and brand-new recipes are going to be making their way into classrooms and homes in and around Poughkeepsie. On a personal note, getting the chance to work with some amazingly fresh and delicious produce is something that I absolutely cherish about my time here at Poughkeepsie Farm Project; when the ingredients you’re using are of this caliber, it doesn’t take much to elevate them – all I’m doing is making sure things don’t burn! I’m extremely excited to be involved with the return of Farm Fresh Home Chefs. These workshops are a chance for us to work directly with the students in the local schools of Poughkeepsie - best of all, the parents are there right beside their kids the entire time. Passing on some basic cooking tips and making kids smile with the occasional deft flick of a knife or a sauté pan is something that I’ve come to deeply enjoy; it doesn’t hurt that the parents leave with some cool ideas for easy, nutritious, and delicious meals. I’m also looking to get the CIA more engaged with the local communities of Poughkeepsie and Hyde Park. One of the projects the senior Applied Food Studies students are planning involves establishing an education garden in one of the local schools in Hyde Park. We’ll be looking to follow some of the successful models established by PFP, and I’m excited to lend the experiences I’ve gained here to the other students and faculty at my school. I’m also working on getting The Brewery at the CIA (yeah, we have our own brewery…the scotch ale is absolutely delicious!) to donate their spent grains to PFP for use in compost. Spent grains are a by-product of the brewing process, and it only makes sense to utilize this by-product that otherwise would be thrown out. In a way, everything comes full circle: CIA students learn how to brew beer, a small percentage of spent grains are used in baking and other cooking applications (think a sort of nutty/malty flavor profile) and the rest will be donated to PFP’s compost pile, where school-aged students will learn all about the process of decomposition. This kind of small-scale community impact becomes a sort of cyclical endeavor that I strive each and every day to reach in all aspects of my work at PFP. Now, it’s time to get cookin’! One of my academic interests has always been food and farming: how can we provide enough quality food for everybody without exploiting workers and undermining ecosystems? I often can only see the obstacles – pest resistances, ecological damages, low quality food, wasted food, poor wages for farm workers, poor working conditions, depletion of soil health, food deserts – the list goes on. The question of individual action always comes up: what can we as individuals do to help?